USB 1.1 and 2.0 interface with 16-bit dynamic range available! The SM200/SM400 is a miniature spectrometer designed for custom OEM applications. It offers a high performance to cost ratio for new systems designs. It can accept light directly through its built-in slit or via optical fiber. A removable fiber coupler faceplate allows use of standard SMA 905, FC and custom fiber connectors. This faceplate also allows direct attachment to dedicated systems and a number of SMX Accessories. A durable aluminum housing encloses the SM200/SM400 optical bench; through careful design this housing provides stable device operation over a wide range of temperatures. The spectrometer sensor array and array driver electronics are mounted inside the SM200/SM400 housing, from there a flex cable connects to exterior support electronics. 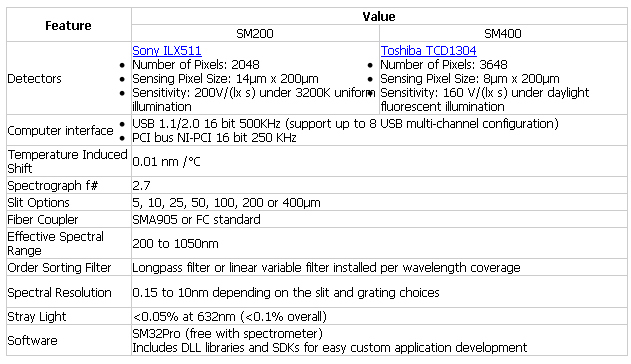 The standard sensor array used is the Sony ILX511 for SM200 and the Toshiba TCD1304 for SM400. The driver electronics have been designed for highly sensitive yet stable operation. The design of the SM200/SM400 also allows the use of custom arrays for special applications, including photodiode assemblies and alternative CCD arrays, as well as the use of customer's own data acquisition electronics instead of using SP's. Standard interfaces to the SM200/SM400 include a USB 2.0 interface with 16-bit extended dynamic range and a PCI card interface with 16-bit dynamic range sampling. Our USB board can support multichannel configuration up to 8. 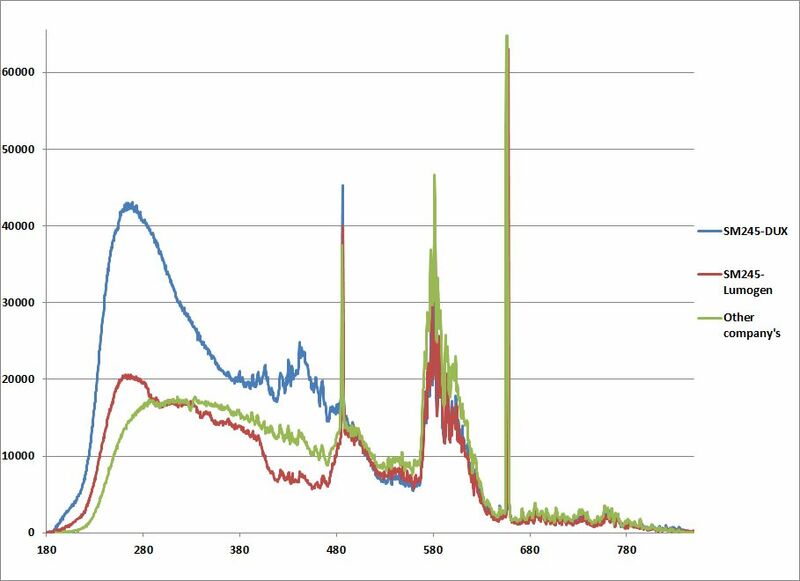 With this multichannel configuration, a high resolution for wide range or a dual spectrometer system (one for measurement and the other for reference) is possible. Software support includes custom DLLs for dedicated applications development and our SM32Pro windows based spectral acquisition and analysis software. Both standard and legacy interface designs provide support for advanced acquisition programming and external triggering.